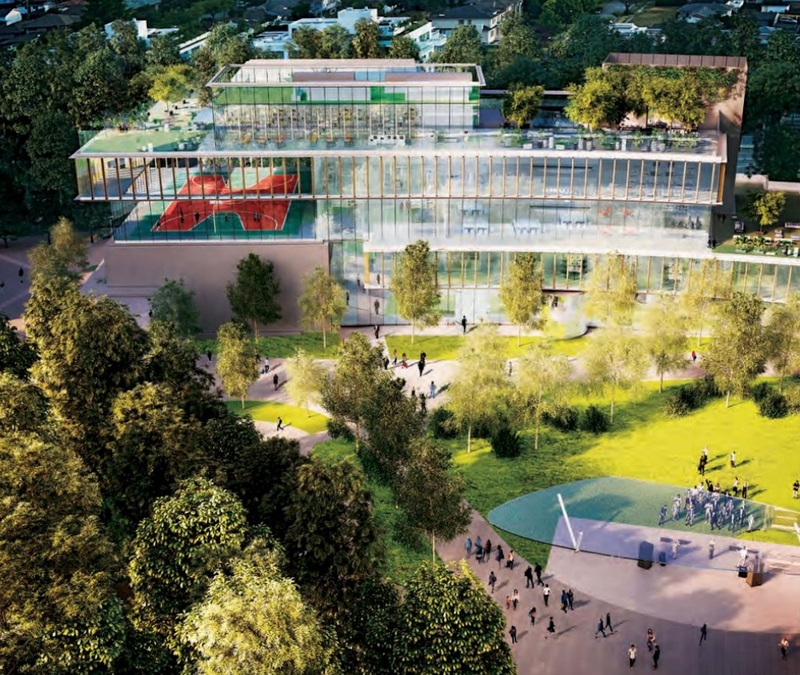 The new community centre and public library planned for Oakridge Centre could set a new design standard for such facilities within the City of Vancouver. 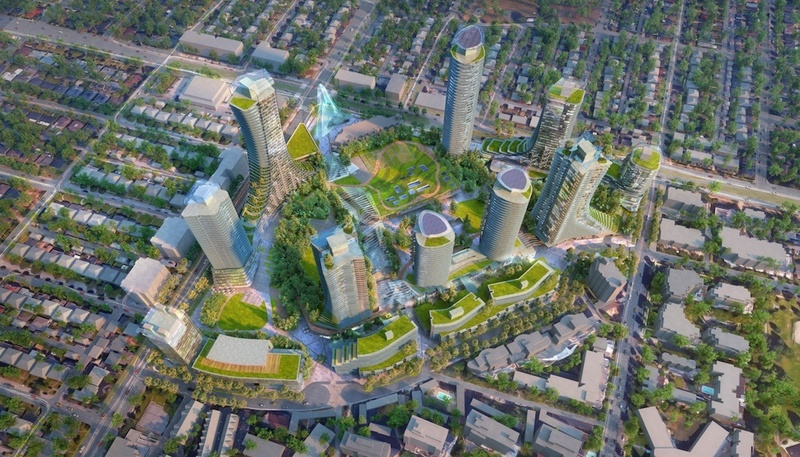 While the city’s community centre facilities are typically single and double-storey buildings, the planned facility that will be built on the northwest corner of the Oakridge Centre redevelopment packs in about 100,000 sq. ft. of floor area into a five-storey building. This will be built and funded by local developer Westbank and mall owner QuadReal Property as one of the community amenity contributions provided by the expansive 28.4-acre redevelopment project. When complete, the municipal government will own and operate the facility. The multi-purpose facility includes a 10,000-sq-ft, ground-floor community events space for rehearsals and performances, complete with a box office, dressing rooms, bar, and coat-check area. It can fit an audience of 200 people seated. 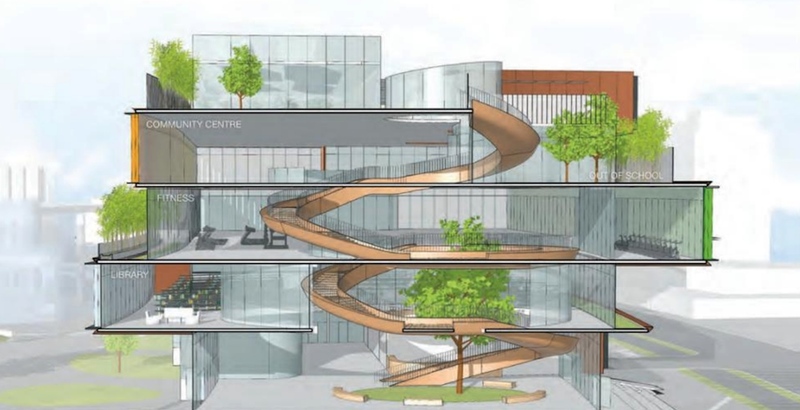 Also on the ground floor is a seniors’ activity centre, youth services, and a portion of the 21,600-sq-ft Vancouver Public Library (VPL) branch, which also occupies the entirety of the second level. 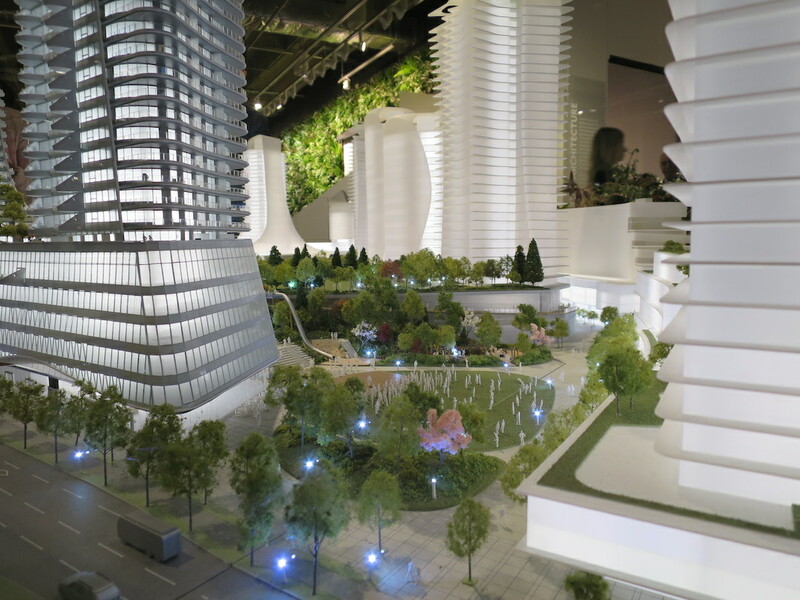 This will be the second largest VPL branch, just after the Central Branch in downtown Vancouver. On the third floor, there will be a double-height gymnasium that also provides a multi-purpose space for larger events and performances, as well as a a fitness gym. Spaces on the fourth floor will be utilized as multi-purpose spaces for lectures, performances, dances, artists, and after-school study. And finally, a daycare and a large outdoor publicly accessible rooftop space is perched on the fifth floor. 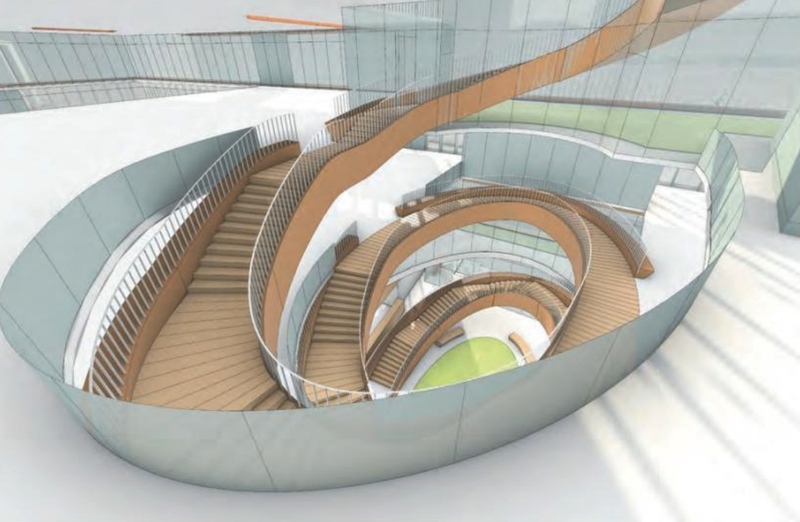 All of these floors are interconnected by an architecturally-unique spiralling staircase that snakes around the building’s centre atrium. “Oakridge Community Centre is envisioned as the cultural anchor of the community, as much a public square as a building,” reads the Oakridge Centre project’s team description, which took inspiration from global examples such as the Kanayama Community Centre, Shanghai Ren Building, Seville Metropole Parasol, and Iceland’s Harpa Concert Hall and Conference Centre. The building is immediately adjacent to the ground-level portion of the redevelopment’s nine-acre public rooftop park. This ground-level ‘Community Centre Park’ includes a playground, large steps for amphitheatre seating with big slides, an outdoor event pavilion for over 2,000 people, and other open spaces. 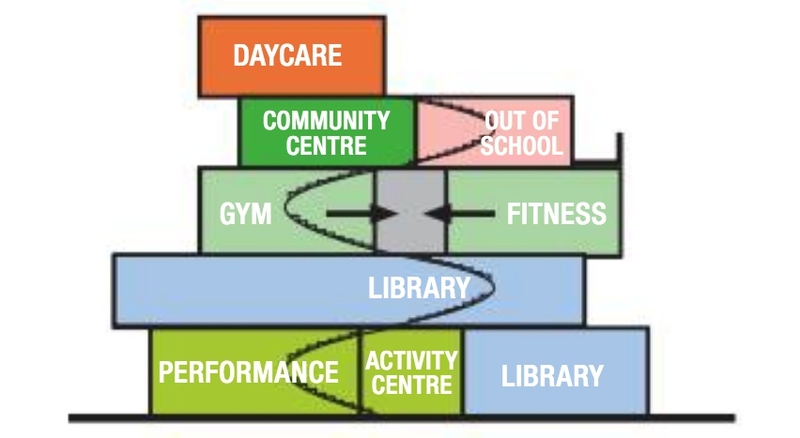 The community centre building complements the private building amenities that will be offered to Oakridge Centre residents and the private Oakridge Athletic Club fitness gym.